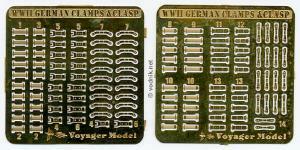 WW2 German Clamps and Clasps were the first 1/35 scale photoetched detail set manufactured by Voyager Models company, located in Shanghai, China. Since the release of this set, Voyager produced a nice selection of PE sets for both modern and WW2 1/35 armor. Set number PEA 35001 is packed in a plastic bag with two small photoetched frets and instruction sheet inside. Instructions only show how to assemble tool clamps, but do not provide any suggestions regarding the placement of clamps on the model. But it is completely understandable, as this is rather versatile set and can be used for most WW2 German military vehicles. Actually the use of this set is not limited to World War 2 armor. Modern Bundeswehr vehicles still have similar clamps on them, used to hold pioneer tools, so the set can be useful also to modern armor modelers. 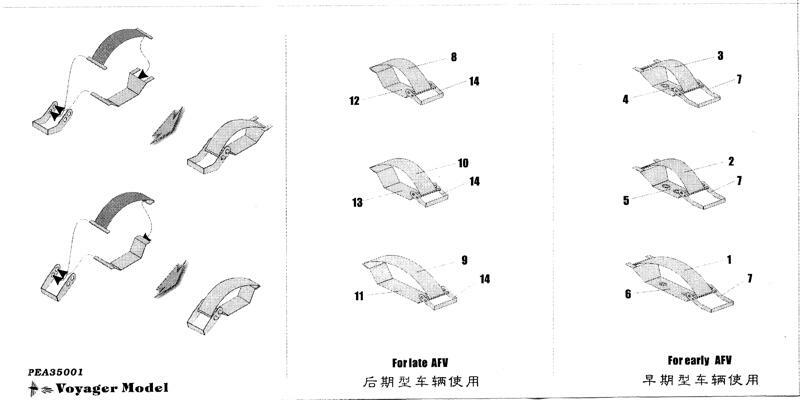 Instructions show how to assemble clamps. Click on picture to enlarge it. Two small photoetched frets are included. Photoetched parts are provided on two small brass frets, 32mm x 32mm (1.25" x 1.25") each. The thickness of brass is typical 0.15mm. - 5 large late clamps. Well, actually what I wrote above is not entirely true - for late type clamps you only get 18 "handles", which are common parts for all three sizes of clamp. This means that you can make total of 18 late type clamps (for example you can make 5 small, 5 large and 8 medium clamps, but you can just as well make more medium ones at the expense of small or large ones if you need). For the earlier type clamps you get enough components to build all 20 of them. The assembly of tiny clamps requires some patience, precision and skill. But assembled clamps should be workable, just like the real ones and in theory do not require glue. The Voyager set is very small and rather cheap at just about $5, but it can make the completed model look much better. Even if you do not plan to use large PE sets to detail your model, you may still consider addition of those brass clamps - one cheap set should give you enough clamps for a few models. Actually I suggest using those clamps also if you use Eduard PE sets for WW2 German armor as most of them include only very simplified one piece clamps. Voyager ones should look much better on you model. I can recommend the set for both WW2 and modern German armor modelers, but only those who have experience in work with very small PE parts. Many thanks to Voyager Model for the review sample! 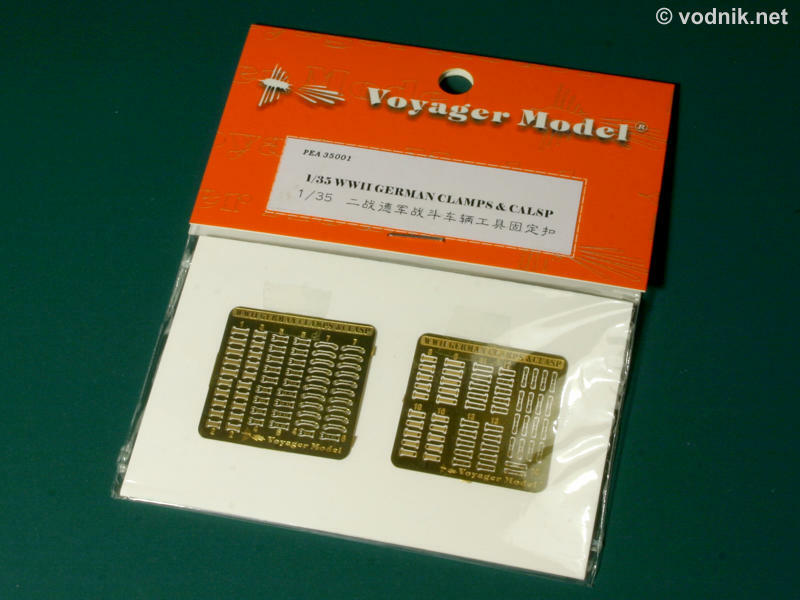 Voyager Models detail sets are available in USA among others from Mission Models. For a list of other resellers and distributors please e-mail Voyager at: Support@voyagermodel.com.